Iris folding is done by arranging and layering strips of paper or fabric in a spiraled pattern that resembles the iris of a camera lens–that's how this craft got its name. You can use this craft technique to create cards and embellishments for scrapbook pages, or the finished project could simply be framed and hung. While the finished product looks complicated, iris folding is actually pretty easy and even a little addicting. The most confusing part is following the numbered patterns typically used, so we created color-coded iris folding patterns for you to follow instead. Once you understand the basics of iris folding, you can create your own patterns and easily follow any numbered patterns you find. Download a free iris folding patterns and try your hand at this craft. Once you get more comfortable with iris folding, you can experiment with different supplies and designs. We will be using the bare essentials to make our simple heart design, except for the Cricut. These supplies are listed in the order you will use them. Plain Paper - Used to print out the iris folding templates shared in the next step. Cardstock - This will be used to cut your design window. Cricut Personal Electronic Cutter - This is optional, but the Cricut was perfect for cutting out the heart and several other shapes. You can also use scissors. Colorful, Decorative Paper or Fabric - cut into strips and used to make the spiral design. The number of different colors/designs needed will depend on the template you choose. Paper Trimmer - Used to cut strips of decorative paper. If you are using fabric, use a rotary cutter and mat. Cellophane Tape - Used to secure your design to the template and also to attach the paper strips to your design window. We have created three color-coded iris folding patterns that you can download in .jpg or .pdf format. Many templates you may find will be numbered with a list of what strips of paper should be matched with which number. We color coded our templates to make it easier by simply following the colors rather than constantly referring to a list of numbers. These templates are approximately 6 inches tall and wide. You can use a graphics program or your printer settings to print them out larger or smaller, depending on the size of your design window. 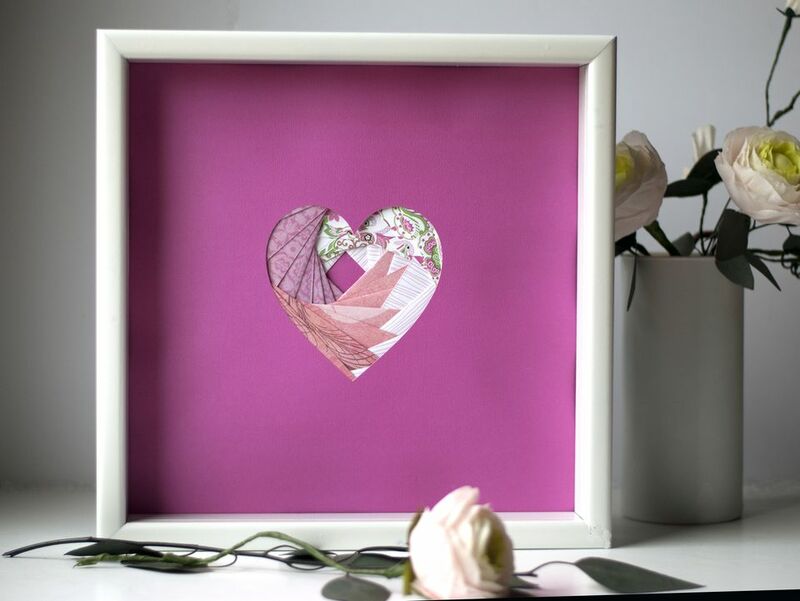 To make the heart in this tutorial, I used the square iris folding template. Download one or all of these templates and print them out. You can reuse each template several times. Once you download and print your iris folding template or templates, you can cut out your design window. Cut your design window out of your cardstock. We went with a simple heart shape, though you can use any simple shape you like. Try something as easy as a square or circle or a fun shape such as shamrock or star. Make sure your design window is a little bit smaller than your iris template. Our heart window is about 4 1/2 inches across. Use a pair of scissors to cut out your design window. We found that the Cricut Personal Electronic Cutter was the perfect tool for cutting many simple shapes. We used the Cricut Designer's Calendar Cartridge, which offered this heart design and many other basic and interesting shapes. Trim down your cardstock to whatever size you want for your finished design. For the Triangle Template, you need three papers. For the Square Template, you need four papers. For the Pentagon Template, you need five papers. We chose four different papers for the square template and used a paper trimmer to cut them into strips approximately 2" x 6". The measurements do not have to be precise. If you use fabric, we suggest using a rotary cutter and cutting mat to cut your strips. Next, you will fold your strips in half, lengthwise, to get a clean edge; this will also make your finished project thicker. If you want your finished project to be thinner, cut your strips approximately 1" x 6". The only problem with folding your strips in half is that it makes your finished project thick. For a thinner finished project, cut your strips so they are approximately 1" x 6" and then do not fold them in half. You can experiment with both ways and use whichever one suits your need for each project. We already cut out the iris folding design window we wanted; now we will prepare it. To do so, simply position the window over the iris folding pattern you printed out. You can turn your template or design window to different angles to see how you like it best. You can also center the middle of the design (the white part) or experiment with it being off center. There's no rule–whatever way you want is the right way! Use small pieces of cellophane tape or blue painter's tape to hold your cardstock still on the template. The part of the cardstock facing up will be the back of your design so don't worry about tape marks. Assign each of your paper/fabric strips to a color on the template. In the photo here, you can see we assigned the light pink paper to the blue section on my template. To start layering the paper/fabric strips, line up the folded edge of the strip to the first line on the blue section of the template. Use pieces of cellophane tape to hold the strip in place. Tape the strip to the cardstock, not to the template. We covered the purple sections of our template with white paper. As with the first strip, line up the folded edge of the strip to the first line of the purple section on the template and tape it in place. Again, make sure to tape the strip to the cardstock or even the other strip, not to the template. Our third strip of paper, pink and green pattern, is matched up with the yellow section of the template. Line up the folded edge with the first line on the yellow section of the template and tape in place. Here, we paired up a different patterned pink paper strip to the green section of the template. Tape one strip in place the same way you attached the first three strips. Your first layer is now in place and you can move onto your second layer. Continue adding paper/fabric strips in the same order and in the same manner as you did the strips for your first layer. Your design window will slowly disappear as it is filled in with paper/fabric strips. Your design will start getting thicker too. Continue to add strips to your design window until all of the colored areas of the template are covered. All you will see once you are done is the small white area in the center of the template. Cover the center of the template. We used the heart that was cut out of the window to cover the hole. You can use any of the colored pieces of paper or fabric that you want. You can also use a photo are just about any other item you want. Carefully lift your iris folding project off the template. Remove the tape, being careful not to rip the cardstock or the template. Flip your design window open and check out the wonderful, spiral picture! Use scissors to trim off any paper or fabric strips that extend beyond the outer edge of your cardstock. Use double-sided tape to attach your iris folding masterpiece onto the front of a homemade card, scrapbook page or mount and frame it.